This is a very unique American River rafting combo trip is recommended for those who are looking for maximum river time and a very exciting challenge. This is perfect for those wanting to experience all the American River system has to offer. We highly recommend you arrive the day before your trip at our Deluxe River Campground located on a rise above the South Fork of the American River, complete with modern indoor restrooms and free hot showers, swimming pool, volleyball court, and more, situated just above Troublemaker Rapid. Our camp has the uniqueness of being located right next to James Marshall Gold Discovery Park on the South Fork. Your two day river adventure begins with a hearty hot breakfast then you’re off to the top of the South Fork of the American River for a 21 mile full day of fun, laughter, excitement, and lots of exhilarating whitewater. Once on the South Fork, the action starts right off the bat and is almost non-stop. You will raft down challenging Class III rapids including Meatgrinder, Triple Threat, and Troublemaker as well as lots of smaller ones. After the first 6 miles the river eases off and becomes very relaxing. Perfect pools between smaller rapids will give you the opportunity to jump in and swim, pick a water fight with your friends or play some trust games. After a few hours of relaxing time on the river its time to pull over for a big yummy lunch. After your hearty deli-style lunch, we’re back on the rafts and off to challenge “The Gorge” and experience the excitement of outstanding rapids such as Satan’s Cesspool and Hospital Bar. This second half is filled with big fun rapids where you are absolutely going to get soaked! You will get to raft all the way into the world famous Folsom Lake. Just before you hit Folsom Lake our own Honda Jet Ski will meet you for the tow to the take-out at Salmon Falls – this way you avoid a brutal two mile paddle out normally in a headwind. Relax by the campfire and reflect on the days experiences before retiring to bed in your tent or under the stars. Rise and shine for an early continental breakfast at 7:00 AM before heading off to the Middle Fork for a day of thrills, challenges, and excitement set in a true wilderness setting. This beautiful river, flowing through rich gold-bearing country, has impressive rapids, including the ultimate in “Big Drops” at the Tunnel Chute Rapid. Here the river descends 80 feet through a very narrow chute. Then you’ll suddenly find yourself underground for 90 feet traveling through a tunnel blasted by the gold miners long ago. Covering 18 river miles, you’ll experience one long, thrilling day on the river on this adventurous trip. We provide you with a hearty deli lunch along the river and ice-cold beverages at the end of your trip. This is going to be one amazing river trip that you will remember for years to come. When you get back to camp you can jump in the shower and clean up for your drive home or spend another night in camp. Regardless you are sure to have the time of your life. There are limited spaces available on the Middle Fork and weekends fill up fast so book soon! This two day rafting adventure is offered Monday & Tuesday, Tuesday & Wednesday, Wednesday & Thursday, Thursday & Friday, Friday & Saturday, Saturday & Sunday, and Sunday & Monday. This trip departs from our River Camp in Coloma. Please Click for Directions. Please call us 1-800-825-3205 or contact us for details. 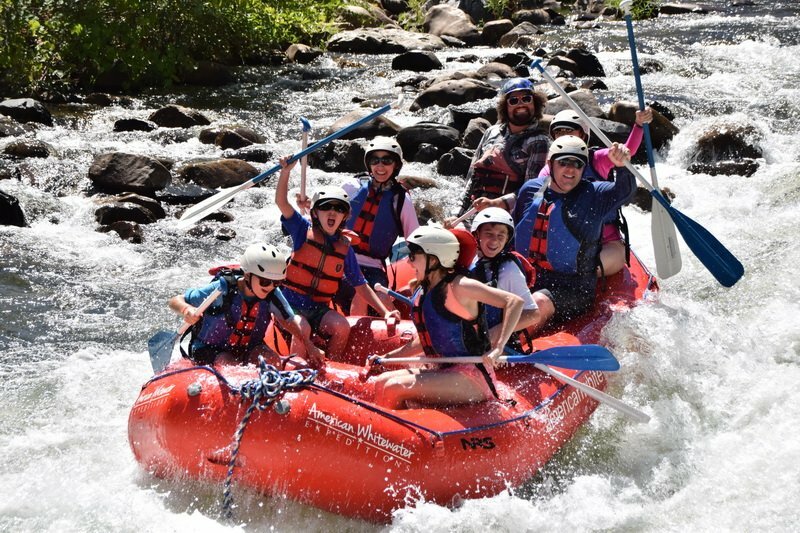 Get ready for some an amazing two days of white water rafting on the South and Middle Fork of the American! Check out our Equipment List for items you will need for your trips as well as Maps and Directions to our River Camp.